First time at Aeon Tebrau City. Mall is outrageously huge, and way better than the Bukit Indah one. Grab ride from Lavender's flagship store at Jalan Serampang took RM 12. Add about RM 7-10 if you're taking from City Square. ~15rm only from city square. Take bus in, i only hate the part on Sunday when going home time. Damn sian. The queue for 160 and 170 is insane but at least it moves fast. Enter ideally before 1200. Optimally between 0900-1000. Leave ideally before 1530-1700, best before 1500, or after 2100. If can secure train tickets to leave, then don't need worry about timing. [QUOTE=kosongice;110232311]Enter ideally before 1200. Optimally between 0900-1000. You can leave later but will jam loh. Although have jam but the queue moves okay-ish. If you're taking 170 then yeah, its a little faster than others. I also wanna know. 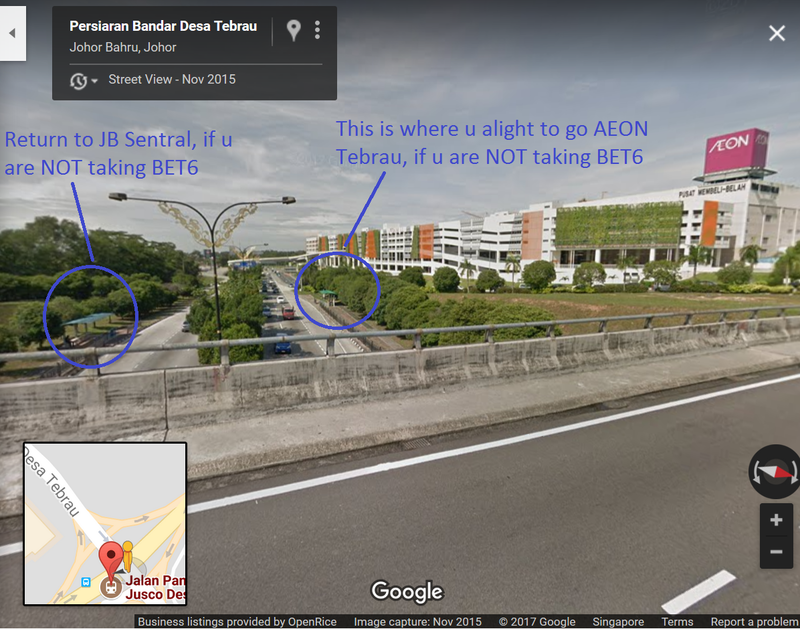 I know confirm have and 1 of the drop off or pick up point is opposite Big Box. My company bus, i always see Msian Alphard/Estima waiting there then ciao. Last edited by kosongice; 11-09-2017 at 08:56 PM..
[QUOTE=kosongice;110233900]Leave so early you referring to going Malaysia or exiting Malaysia? For going, you'd wanna go before 1200. This is to avoid clashing with the working crowd crossing the border. I say optimally between 0900-1000, because you are going from Woodlands, and after 10ish the frequency for 950 can get super irregular. I've once encountered 1 hour plus intervals between each bus service. Alternatively, you may want to board 856, alight at the Woodlands train station, and walk over to Singapore customs. It takes around 10-15 minutes. Go check train tickets lo, although likely to be sold out, especially the popular timings, you never know with such things. Arbo jiu leave later lo. I'm currently in JB, bought 2220 train ticket home and now lepaking in Starbucks, charging my phone and jiaking peanuts I bought earlier from pasar malam. Oh, I edited my earlier post also. You go to the KSL pasar malam arh?